Today's recipe is one of the hit recipe of Indo-chinese cuisine. It tastes sooper delicious and makes a favorite starter dish of everyone. 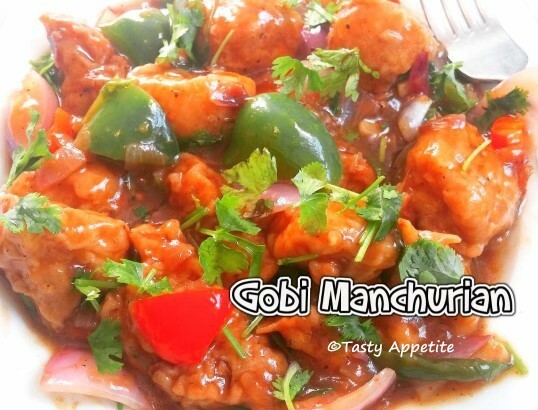 Its absolutely easy to prepare restaurant style gobi manchurian at home. I make them quite often and its always a fail-proof recipe. This can be prepared both in gravy and dry version. In this recipe, the crispy cauliflower fritters are tossed in sweet & sour spicy manchurian gravy. Try this tantalizing Indo-Chinese dish at your home today with this easy video recipe. Wash and clean cauliflower & chop to small florets. In a mixing bowl, add maida flour, corn flour, rice flour, pepper pwd, salt and soya sauce. Add enough water and stir to smooth thick paste. Add cauliflower florets and coat with the paste. Let it marinate for 15 to 20 mins. Add the marinated cauliflower and deep fry in hot oil. Deep fry until its crisp and golden. Strain and remove from oil in kitchen tissue. In a fry pan, heat a tbsp of oil. Add sliced green chilly and chopped coriander leaves or spring onions. Add soya sauce, tomato ketchup and saute. Add salt, (add little salt as soya sauce has salt in it), pepper pwd, red chilly pwd and sugar. Add 1/2 cup of water and combine. Add lemon juice or vinegar and mix. Make a paste out of 2 tbsp of corn flour and 1/2 cup of water. Add this paste to gravy and combine. Add cubed onions and capsicum. Sprinkle freshly chopped coriander leaves or spring onions and garnish. Serve hot with fried rice, noodles or naan.